Paradise Park was one of the earlier features to open during the five year renovation of Disney California Adventure. 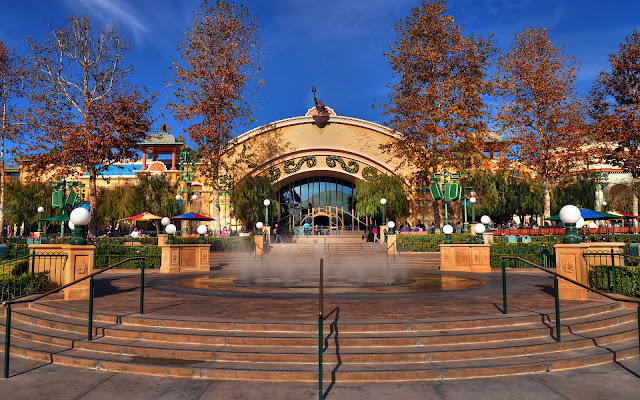 Built as the main viewing area for the nightly spectacular, World of Color, the park also afforded a lovely place to take a stroll or just sit and taken in the scenery in front of Paradise Bay. A year later, in the area formerly occupied by the Golden Dreams show, The Little Mermaid: Ariel's Undersa Adventure opened. The lavish, Victorian-inspired facade was a sign of the new, more elegant Paradise Pier, and while it retained some elements of the former building, such as the San Francisco Palace of Arts recreation, it was by and large a prettier, much more fashionable replacement for its predecessor. Together, the two form a wonderful backdrop for the front side of Paradise Pier, and a lovely evolution for DCA! Looking at the facade of The Little Mermaid show building.